The Detroit Red Wings closed their season out in dramatic fashion, falling 4-3 in overtime to the New York Islanders. They finished fifth in the Atlantic Division and also fifth worst in the NHL. Only the playoff-clinching Philadelphia Flyers lost more overtime games than Detroit’s 13 (14). Henrik Zetterberg scored first, as the Wings entered the intermission up 1-0. In the second period, Andrew Ladd tied it, before Justin Abdelkader scored a power play goal, his 100th of his career. The third period saw Detroit put up 16 shots, including a weird goal by Dylan Larkin. He managed to poke a bouncing puck past goalie Thomas Greiss. Fans did the ‘wave’ for seemingly the first time all season during the third period. The Isles then tied it with goals by Anders Lee and defenseman Ryan Pulock. Lee scored his 40th goal of the season on a spin-around backhander that squeezed by the left shoulder and post of Jared Coreau. Pulock then tied it with 30 seconds left to bring yet another game this season to OT. Coreau played outstanding for most of the game. Anthony Mantha had a breakaway in the extra period, but a sprawling, pad-stacking effort poked the puck away. Greiss also saved a strong chance from Athanasiou. Finally, John Tavares ended the game with a deke-and-shoot that fooled Coreau. He completely fooled the backchecking Mantha as well. The season concluded with that goal. An extended salute to the crowd sent the team into the off-season. Detroit looks forward to the NHL Draft Lottery where they will have an 8.5% chance of winning the first overall pick. 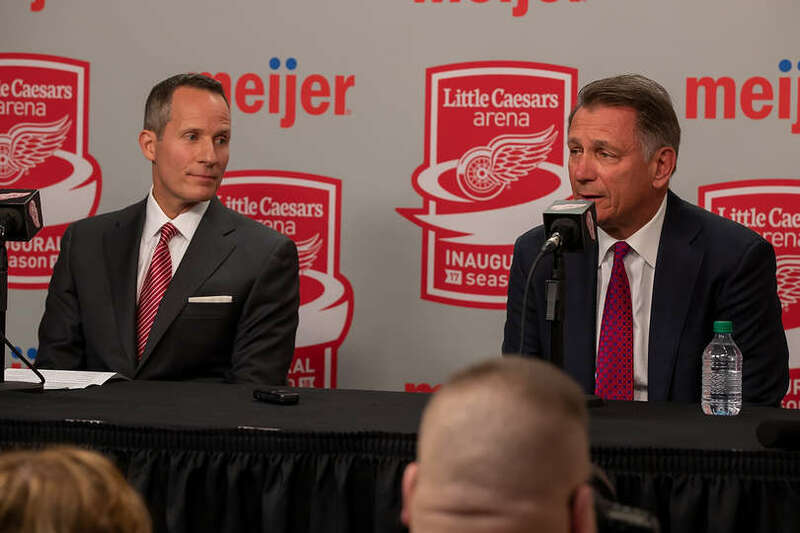 General Manager Ken Holland received a two-year contract extension shortly before the game began. He is the second-longest tenured general manager, and next season will be his 22nd year. The organizational rebuild is in full swing, and owner Chris Ilitch will see how Holland will handle the upcoming years. As for coach Jeff Blashill, look for an announcement on Tuesday afternoon. Veteran forward David Booth, signed out of last September’s training camp, likely played in his final NHL game. The 33-year old scored four goals and one assist over 28 games. He received 12:51 of ice time. The Grand Rapids Griffins, Detroit’s AHL affiliate, qualified for the Calder Cup Playoffs last night. They will have goalie Jared Coreau, forward Evgeny Svechnikov, and defenseman Joe Hicketts back. Tyler Bertuzzi may join as well, depending on how the team proceeds with his development.